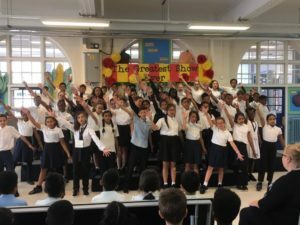 The Tapscott Learning Trust in Newham is celebrating after its partner schools scooped a raft of major national awards. The Trust, which consists of Ranelagh Primary School in Stratford, Curwen Primary and Nursery School in Plaistow and Kensington Primary School in Manor Park, now boasts a range of new awards for its innovation and achievements in the fields of professional development, religious education, promoting citizenship and sport. One Trust school, Ranelagh Primary School based in Stratford, has been awarded the Religious Education Quality Mark. The REQM recognises high quality RE, particularly those schools which are providing their learners with authentic experiences and contributing to whole school outcomes. The award reflects the commitment the school is demonstrating to diversity. The Trust has also seen success in the form of the Achievement for All Quality Mark, which was awarded to Kensington Primary School as a result of its efforts to create an “inclusive and nurturing environment for children to grow and develop into exceptional citizens”. As well as the individual school awards, Tapscott Learning Trust’s own independent Training Hub has scooped the Professional Development Quality Mark. This achievement celebrates the Training Hub’s efforts to champion continuous professional development among its staff through nationally recognised programmes as well as bespoke training tailored for particular school needs. Over the summer break, it was also confirmed that both Ranelagh and Kensington were awarded the School Games Gold Kitemark and that Curwen Primary School maintained its Platinum Kitemark. Focusing on participation, competition, workforce and clubs within the local area, the Trust has “excelled” in the sporting arena over the last year.